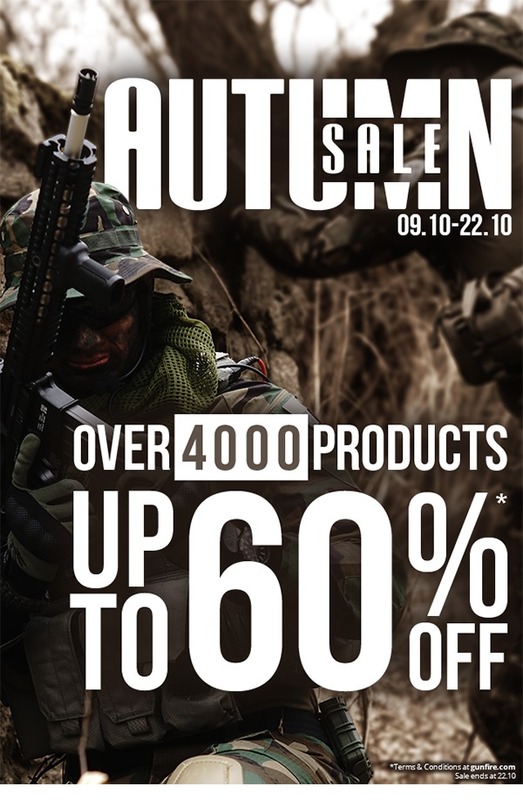 Autumn Sale has just arrived at Gunfire! Over 4000 products on sale and discounts up to 60%OFF. Autumn is already here, but that’s no reason to give up a weekend airsoft game. Get yourself ready for the changing weather conditions and save up to 60% on over 4000 products from our Autumn Sale offer. This time of the year is also an excellent moment for the equipment check-up. So if you want to grab some new accessories, parts or reload your magazines with brand new BBs, just visit our website. The special offer includes replicas discounted up to 46%OFF, like the new KA-AG-57 replica from King Arms. If you already have your own replica you could definitely use some accessories or spare ammo which we’ve discounted by up to 60%OFF and 24%OFF. Among them is a wide range of products from IMI Defense, Madbull or Guarder. It’s also worth taking care of your comfort during outdoor activities. We recommend you a new line of clothing – DRY from BRUBECK®. Due to high-quality materials and protection against cold or overheating, these products are perfect for airsoft skirmishes as well as for jogging. Gear up for Autumn with Gunfire and do not miss the best deals!